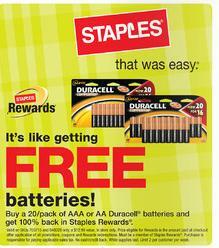 Staples is offering two FREE 20-packs of Duracell AA or AAA batteries starting Sunday, 3/27 through 4/2. You'll pay for the batteries and receive 100% back in Staples rewards. You must be a rewards member, but it is quick and easy to sign up in-store. Limit 2 FREE packs per card. Heading to the mall this weekend? Use this Bath & Body Works Coupon to get a free 2 oz Country Chic Lotion at Bath & Body Works on 3/25 and 3/26. CLICK HERE for a printable coupon valid for $10 off $25 at JCPenney. The coupon is valid today, 3/25, & tomorrow, 3/26. Great new coupons from Recycle Bank...get signed up!If you like to order homeopathic, all natural, or even gluten free products, this is probobly worth looking into! If you haven't already signed up for Recycle Bank, head HERE to get started! They are a website trying to help each community to "go green". I have only participated in the online educational readings and games and have had many opportunities to "buy" great coupons with my points. *Candace LOVES Cheeburger Cheeburger, so I am glad for a place to get some coupons!!! You take small actions. We give you everyday rewards. The world gets greener. Whether you pledge to use less energy, increase your at-home recycling or even just learn how you can increase the green in your home and neighborhood, we’ll reward you through grocery store savings, drugstore coupons, and discounts on the brands you buy every day. This way, you reap the rewards of not only brightening your community and helping your environment, but also truly benefit from meaningful savings. If you like to order homeopathic, all natural, or even gluten free products, this is probobly worth looking into! *To find ideas for earning quick points you can look under "recycle bank" in the archives. Head here to sign up for the 7Gen Newsletter and print some coupons! Join Gifts to Grow now and get 100 Free Points. "Have you signed up for an account yet? All kinds of gifts can be bought with points...not just for babies!" From knowing exactly when they want teddy to comforting them at 3am, the list of love is endless. Gifts to Grow gives parents the rewards they deserve, simply by buying Pampers diapers and wipes. Join now and get 100 Free Points. Free Greeting cards next week!!! Beginning 3/27, Rite Aid will have an in-ad coupon for $3 off 3 American Greetings Cards. Card prices start at $1.29, so if you buy 3 at $1.29 your total will be $3.87. $1/3 American Greeting Cards PDF coupon! Click the image to print the coupon. 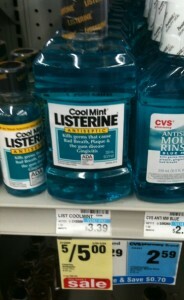 This week CVS has Listerine on sale for just $1 and there is a new $2/2 Listerine coupon that does not have any size restrictions. WOW! Get this fantastic coupon for a free Happy Baby item .including HappyBaby, HappyBellies, HappyBaby Puffs, HappyBites, HappyMelts, and HappyMunchies (excludes pouches) by signing up on the Facebook link. Limit 1 coupon per item! ..hope someone gets some use from this!! We're glad everyone is so anxious to snag a FREE bottle of the new Suave Professionals line- bare with the Giveaway tab, there are tons of our fans trying all at once! Keep trying and enjoy the free product. http://on.fb.me/e2y2bX. Suave has a fun new game available called, CanYouTell.com where you compare the new Suave Professionals products with top salon brands. Answer 3 of the 7 correct and you should be able to get a free product, less than that and you get a coupon. To get this deal just head over to Barnes and Noble. The price is listed at $4.97- add it to your cart and use code: K4M8W9D at checkout. 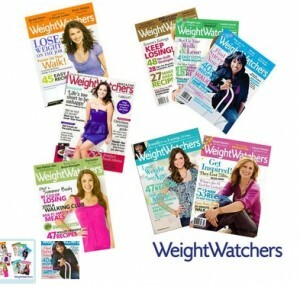 Tanga has a great deal on Weight Watchers once again. You can get a one year subscription for $2.99! This magazine has 6 issues per year so .49 each! Just head over to Tanga.com and add it to your cart at $14.99. You can get up to 4 years at this price. Use promo code: WEIGHT at checkout and the price will drop to $2.99. Right now you can get Family Fun magazine for 1 year for just $5. If you are a new account to Mamapedia.com, you can take $4 off your order with code: INTRO4. That makes the final price just $1!! Just head over to Mamapedia and you will want to look on the right side toward the bottom for this deal. This code can be used on other deals available today- you just need to be a new customer. "Like" them on Facebook, then take a 3 question survey! overwhelmed when they first hear their child has special health care needs. There are so many questions and knowing where to begin is confusing. The Special Needs Resource Directory can help by connecting you to the information and support you need at each stage along the way. TGIFridays has another GREAT coupon. Today kicks off our three-day Spring Fling! Start today by using promo code SPRING and receive $3 off any Eversave purchase. Warmer weather is on its way and we're celebrating with some great spring-themed Saves. And don't forget to spread the word to friends and family! You (like any sane person) chose red wine and Glee over icy sidewalks and rickety treadmills over the past couple of months. But now your jeans are just a tad tight and swimsuit season will be here before you know it. Not to worry because we've found a fast, effective way to tone and tighten your perfect frame: $60 gets you three 90-min outdoor boot camp classes at one of 3 Philly locations from Bootcamp Republic ($125 value). Earn $5 Groupon Bucks when you use the Groupon mobile app to purchase a deal. * But hurry, this offer is only valid through April 8, 2011. Learn more about this offer. Webkinz.com is giving account holders a FREE virtual bunny and extending the features for a year. You must already have an account at Webkinz.com to get the bunny. •Look for the banner for Hop on the far right side of the screen. If you don’t see it, keep refreshing or logging in and out. Today Only – Select colors of the Vera Bradley Tote are on sale for $29.00. This offer is valid Monday, March 21, 2011 only. Just click the colors on sale tab to see sale colors. There is a B2G1 Suave Body Wash Product, exp. 4-17-11 (RP 03/20/11) that was supposed to be in today’s inserts. Mark the First Day of Spring with FREE Italian Ice! Rita's annual giveaway will be held on Sunday, March 20 from noon to 9 p.m. at all open Rita's locations. This is surely a tasty tradition that you won't want to miss! So be sure to stop by your local Rita's location and celebrate the arrival of spring on us! Another Great Frozen Foods week at GIANT! Buy 6 participating products and get $5.00 off instantly.